Developing a map for an Interactive Fiction environment can be challenging especially if the game is based on real-world geography, as is the Historical Williamsburg Living Narrative. A large part of the value of this game is the historical accuracy–which not only includes the events of the time but the geography and architecture as well. In designing the game map, I am considering external landscape and building floor plans separately, and here I describe the process by which the external landscape portion of the game map was developed. I started working from the map provided by the Colonial Williamsburg Foundation for guests visiting the city. Below is a scanned version of that map, already partially “cleaned up” (that is, much of the extraneous information–modern buildings, bus route lines, restroom symbols, etc.–have already been removed). After working with this map for a brief period of time, I found a few characteristics I didn’t like. Most significantly, there wasn’t a sufficient level of detail regarding building shapes and grounds, and the relative sizes, locations, and distances between buildings wasn’t accurate enough for me to use in creating descriptions. At this point I changed my approach. In order to ensure fidelity to the actual physical layout of Williamsburg, I decided to use satellite imagery for the initial layout work. Google Maps provided excellent resolution from the Governor’s Palace in the north to the Public Hospital in the south, and the College of William and Mary in the west to Christiana Campbell’s Tavern in the east. The city’s overall layout was depicted quite clearly. Once I had an accurate map from which to work, I was able to select the significant buildings, associated grounds, and pathways between that the player would be using. I superimposed this image on top of the map, and this gave me the level of detail I wanted for development. Peeling away the city map, this is what the initial pass at the game map looks like. 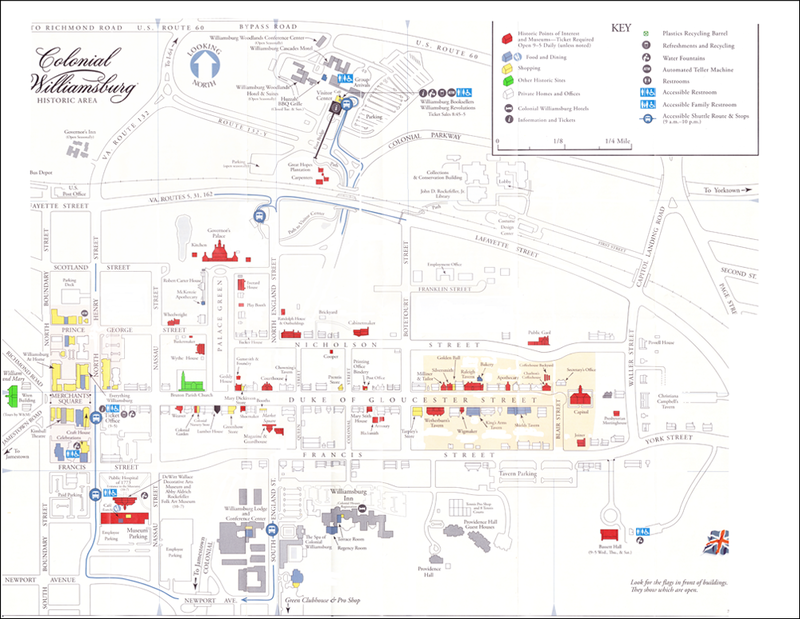 While this map contains all the information needed to create accurate location descriptions (for example, it will be important to note the distance of the College of William and Mary from the city proper), this version of the map is a bit difficult to work from in building the Interactive Fiction navigation scheme. 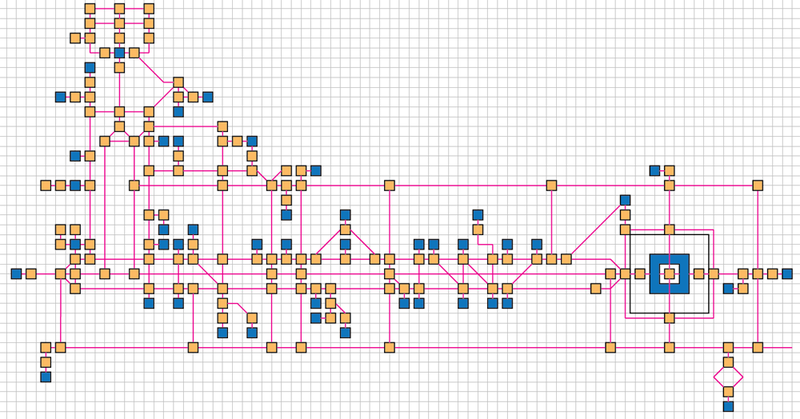 For that task, a logical map is more appropriate. This logical map was built from the physical line map (above), connecting locations using only the eight compass directions, and not taking into consideration the sizes of buildings or their actual distance from each other. Also, no assumptions can be made between “nodes” in the map below if they are not connected by a direction line. In other words, if a node is to the west of another node, but they are not connected by an east-west line, they may not be precisely east and west of each other. This map simplifies and compresses the physical map information for ease of navigation programming. The yellow nodes represent place locations where the player may go, while the blue nodes represent buildings or structures that have additional rooms or internal locations not depicted here. Those additional locations will be represented in further mapping exercises. By using this logical map along with the visual information obtained from the line map superimposed from the Google satellite image, I will be able to create rich in-game descriptions of the physical Williamsburg environment. For example, an east-west running path on the logical map may actually be a long, curved road on a hilly slope, and that level of detail will be captured in the game for a rich and hopefully satisfying experience.